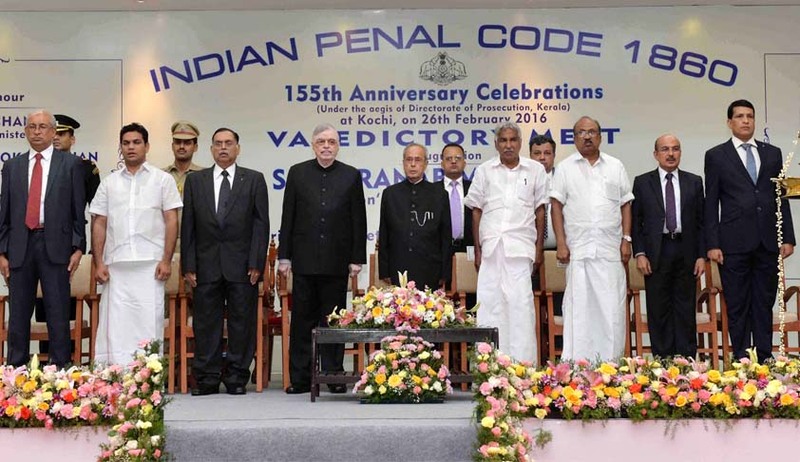 The President of India, Shri Pranab Mukherjee inaugurated the Valedictory Function of 155th Anniversary of the Indian Penal Code (IPC), 1860 organized by the Directorate of Prosecution, Kerala today (February 26, 2016) at Kochi, Kerala. Speaking on the occasion, the President said there is no doubt that the IPC as a premier code for criminal law is a model piece of legislation. Nevertheless, it requires a thorough revision to meet the changing needs of the twenty-first century. The IPC has undergone very few changes in the last one hundred fifty-five years. Very few crimes have been added to the initial list of crimes and declared punishable. Even now, there are offences in the Code which were enacted by the British to meet their colonial needs. Yet, there are many new offences which have to be properly defined and incorporated in the Code. The President said security of citizens and of property is an essential function of a State. It is achieved through the instrumentality of criminal law. The mandate of criminal law is to punish criminals and prevent recurrence of crime. Criminal Law has to be necessarily sensitive to changes in social structure and social philosophy. It has to be a reflection of contemporary social consciousness and a faithful mirror of a civilization underlining the fundamental values on which it rests. The President said the ‘Rule of Law’ is the cardinal principle on which a modern state rests. It has to be upheld at all times. It is incumbent on the law enforcing agencies, particularly the police force, to fulfill its foremost duty of maintaining law and order sincerely and with dedication. The image of the police depends on its ‘actions’, in ensuring prompt, equitable and fair enforcement of laws. The police in our country must go beyond its role of being a law enforcing body. It has to also be a proactive partner in growth and development. The founding fathers of our Constitution had conceived inclusiveness, tolerance, self-restraint, honesty, discipline, respect and protection of women, senior citizens and weaker sections as essential ingredients of our democracy. Our police force must incorporate these features in its functioning. The President said public prosecutors also play a crucial role in upholding the Rule of Law. They play a key role in instilling and strengthening public confidence in the criminal justice system. Prosecutors are obligated to ensure that the accused receive a fair trial while looking after the interests of the victims. It is therefore essential to equip public prosecutors with tools and knowledge to enable them to effectively respond to various forms of crimes. He called upon the public prosecutors to play a more strategic and pro-active role in formulating crime control policies. He stated that their efforts must be directed at ensuring the prevalence of a fair, transparent and efficient criminal justice system in the country. The Full texy of the Speech of the President of India at the valedictory function of the year long celebrations of 155th anniversary of Indian Penal Code 1860 in Kochi, Kerala. 1. I am happy to take part in this valedictory function of the year-long celebrations of one hundred and fifty-fifth anniversary of the Indian Penal Code (IPC). At the outset, let me compliment the Directorate of Prosecution, Kerala, under whose aegis this occasion is being marked. 2. The IPC is one of the legislative fiats of the British Indian regime which, on account of its fair accuracy, has withstood the test of time. As Sir James Stephen had mentioned about the qualities of a strong law and I quote: “It is not enough to attain a degree of precision which a person reading in good faith can understand. It is necessary to attain a degree of precision which a person reading in bad faith cannot misunderstand” (unquote). The definitions of crimes in the IPC hold good even today though relevance of some and emergence of new forms of offense like cyber crime call for refinements. 3. Security of citizens and of property is an essential function of a State. It is achieved through the instrumentality of criminal law. The mandate of criminal law is to punish criminals and prevent recurrence of crime. Criminal Law has to be necessarily sensitive to changes in social structure and social philosophy. It has to be a reflection of contemporary social consciousness and a faithful mirror of a civilization underlining the fundamental values on which it rests. It is in this broad perspective that the drafting, formulation and working of the Indian Penal Code has to be seen. 4. The Indian Penal Code was drafted by the First Law Commission of pre-independent India. This body was presided over by Lord Macaulay and consisted of J.M. Macleod, G.W. Anderson and F. Millet as members. They drew upon not only English and Indian laws and regulations but also Edward Livingston’s Louisiana Civil Code of 1825 and the Napoleonic Code. The draft Code, which was submitted to the Governor General of India in 1837, underwent revisions at the hands of eminent jurists, judges and professors. The revisions were completed in 1850. It was presented to the Legislative Council in 1856 and was passed in 1860. The Penal Code came into operation on the first day of January 1862. 5. The objective of the IPC is to provide a general penal code for India. It codifies the laws relating to the offences which it deals with. The Code is divided into twenty-six chapters though originally it had twenty-three. The offences described in the Code fall into two categories, namely (i) offences against the State and the public; and (ii) offences against person and property. In this respect, the IPC adopts the same classification as that of the civil law. 6. This division of crime into public and private offences has received the acceptance of eminent jurists who justifies it by a reference to the division of civic duty into absolute and relative duties. Absolute duties are those which the subject owes to the State, and the violation of which constitute an offence against the State. Relative duties are such duties which the subjects owe inter se and the violation of which constitutes offences that necessarily involve the rights of specific individuals. 7. Transgressions in absolute duties directly affect the community at large, and therefore, offences falling in this category are as a rule non-compoundable. On the other hand, offences affecting a particular individual are as a rule compoundable, unless they by their heinousness so affect the community as to be declared non-compoundable. 8. The Constitution of India came into effect on twenty-sixth January 1950. Under this noble document, citizens of the country were entitled to certain guaranteed rights. There were also Constitutional safeguards protecting the life and property of individuals as well as of public. These provisions in the Constitution reflect a broad framework underlined in detail in the IPC. For instance, assault on person and public are defined in the IPC along with graded punishments for them. Different courts and procedures have been decreed for different offences. 9. There is no doubt that the IPC as a premier code for criminal law is a model piece of legislation. Nevertheless, it requires a thorough revision to meet the changing needs of the twenty-first century. The IPC has undergone very few changes in the last one hundred fifty-five years. Very few crimes have been added to the initial list of crimes and declared punishable. Even now, there are offences in the Code which were enacted by the British to meet their colonial needs. Yet, there are many new offences which have to be properly defined and incorporated in the Code. 10. In a developing country like ours, where economic success is crucial for inclusive growth and national progress, economic offenses cannot be allowed to impede on our national objectives. Crime of a fiduciary nature is also a crime against the State and its people. Some economic offenses can be as serious as the other crimes which have been so meticulously defined and carefully catalogued in the IPC. It is a challenge to bring all new-age offenses with its intricacies within the ambit of the criminal law. 11. This century has witnessed the proliferation of technology in wider spaces of human interaction and transaction. It has resulted in greater conveniences but at the same time has led to occurrence of newer types of offenses. Crimes in the cyber space like email spoofing, financial fraud, online gambling, match-fixing, cyber defamation and cyber stalking call for an ingenuous and proactive response from the law providers. 12. The ‘Rule of Law’ is the cardinal principle on which a modern state rests. It has to be upheld at all times. It is incumbent on the law enforcing agencies, particularly the police force, to fulfill its foremost duty of maintaining law and order sincerely and with dedication. The image of the police depends on its ‘actions’, in ensuring prompt, equitable and fair enforcement of laws. The police in our country must go beyond its role of being a law enforcing body. It has to also be a proactive partner in growth and development. The founding fathers of our Constitution had conceived inclusiveness, tolerance, self-restraint, honesty, discipline, respect and protection of women, senior citizens and weaker sections as essential ingredients of our democracy. Our police force must incorporate these features in its functioning. 13. The onus is on our law-enforcing agencies to work towards transforming the ‘archaic police system’ and bring it in tune with the requirements of a modern democratic nation. Our police officers must ensure quick redressal of the grievances of the common man. They must partner other stake holders in creating a peaceful and secure atmosphere conducive to progress and prosperity. 14. Public prosecutors, too, play a crucial role in upholding the Rule of Law. They play a key role in instilling and strengthening public confidence in the criminal justice system. Prosecutors are obligated to ensure that the accused receive a fair trial while looking after the interests of the victims. It is therefore essential to equip public prosecutors with tools and knowledge to enable them to effectively respond to various forms of crimes. In this context, I compliment the Directorate of Prosecution, Kerala, which has been rendering a commendable service in training public prosecutors and moulding them with new techniques and methods of prosecution. I call upon the public prosecutors to play a more strategic and pro-active role in formulating crime control policies. Your efforts must be directed at ensuring the prevalence of a fair, transparent and efficient criminal justice system in the country. 15. With these words, I conclude. I once again applaud the Directorate of Prosecution, Kerala, for their endeavour to celebrate the 155th anniversary of the IPC. I hope the conduct of such an event would spur serious debate and discussion on criminal law reform. I wish you all the very best for the future.